The ominous report from the President's Debt Commission, titled "The Moment of Truth" delivers its hell fire and brimstone debt sermon from the get go. Laying out what it calls "unavoidable conclusions," the commission report put the problem is simple terms: "The problem is real. The solution will be painful. There is no easy way out. Everything must be on the table." In a nutshell, here is their plan, as self-described "starting point for a serious national conversation." Preserve Social Security by protecting poor seniors and distributing burden fairly. The report also calls for raising the retirement age. It's a stark and complex plan, that the commission itself hopes will force the debate in Washington. In introducing their plan today, the co-chairs had tough words for Washington and the interest groups who stake out tough positions on all sides. Democrat Co-chair Erskine Bowles said "I think it's impossible to sweep our nation's debt problems under the carpet anymore." 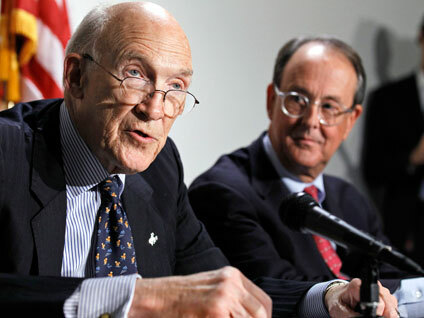 But, Republican co-chair Alan Simpson, a former Senator, cautioned the 12 members of Congress on the committee. "Poised outside this chamber are the denizens of darkness," which he said were interest groups waiting "to shred this baby to bits." He cautioned them to be strong and force action on the plan.